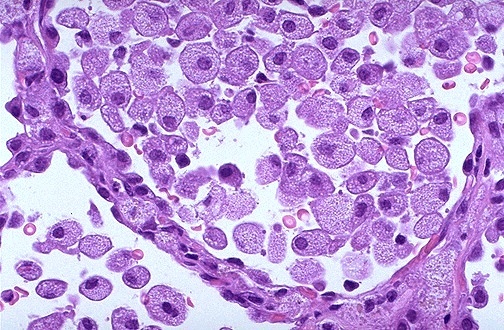 This is the microscopic appearance of an endogenous lipid pneumonia in which numerous foamy lipid laden macrophages are present in alveolar spaces. The term endogenous refers to the origin of the lipid material from breakdown of lung and blood, usually distal to the site of an obstructive process (such as a neoplasm, an inhaled foreign body, or bronchiectasis). Blood monocytes become macrophages that collect to ingest the lipid material.